There is nothing like a war novel for irony. There really isn’t. If a reader’s tastes run in that direction, sending them toward sardonic novels like Catch-22, Slaughterhouse-Five, Johnny Got His Gun, The Manchurian Candidate, and other such war novels will do them no disservice. 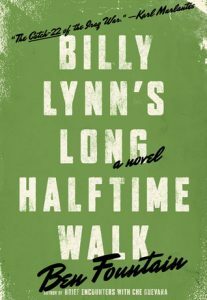 These novels are also great for character voice, and Billy Lynn is no exception. The clear, funny, and painfully human voice of the main character is a masterpiece. Few elements of American culture are left unskewered, from family to football to Beyoncé. Dragged out for particular punishment are hypocrites in religion and politics. It’s a strange world when Hollywood is more sane than the man on the street, but that becomes the believable world of this book. I recommend the book mainly for older teens and adults with a taste in irony, possibly also for those who need to be able to cope with a situation out of their control and have a black sense of humor. If a reader is a fan of something like Shaun of the Dead, this will probably be a most enjoyable book.